Summary: The three Diamond sisters survived the summer in style after coming to live with their long-lost billionaire father. But making a place for themselves at their exclusive new Las Vegas private school is throwing them any number of gold-plated curves. Savannah's YouTube stardom turns into a Sweet Sixteen reality show extravaganza—with complimentary enemies on the side. Dangerous flirtations don't keep Peyton from a gamble that will risk far more than she planned to bet. And when Courtney and the sisters' archenemy, Madison, uncover two explosive secrets, it will rock even this town of glittering illusion—and turn their lives upside down all over again. I finished the first book in this series a week ago (and my link to that review can be found at the top of this post), and I was absolutely hooked. I debated breaking up my series-reading (because sometimes reading books one after another in the same series throws me off and I don't like it), so I planned on picking up another totally different book to break it up a little bit. But after the end of The Secret Diamond Sisters, I was just too hooked. I wanted to know more, and I wanted to know it right away. It became an addiction, like my Gossip Girl addiction that I had a few years back. (I took out every Gossip Girl book and read them all within a few weeks. It was crazy and I'm not even slightly ashamed of it.) So instead of giving myself a break, I immediately grabbed Diamonds in the Rough and dove right into it. And despite it being a nearly 500-page book, I finished it in three days. I brought it to school and read it whenever I had a free second because I just kept wanting to know what would happen next. On a side note: This book is definitely one that will diagnose you with my infamous "One More Chapter Sydrome" - where you keep telling yourself that you'll just read "one more chapter" before going to bed/doing homework/being productive, but before you know it, you've finished the entire book. Anyway, the actual story itself is even more entertaining than the first book - who would have even thought that was possible? Savannah, Courtney and Peyton have all sorts of new drama to sort through - and plenty of plot twists to keep us readers occupied from start to finish. **Major spoilers ahead!! Skip to the next paragraph if you haven't read the book yet!! ** Okay so there were TWO major plot twists in this book that actually made me gasp out loud and have to put the book down to collect my thoughts. I was so seriously floored that I had to take a break to update my Goodreads reading progress to mention it, and I even Tweeted author Michelle Madow because her plot twist was seriously so freaking EPIC that I was stunned and just had to tell her myself. I mean, seriously -- Adrian Diamond being Madison's father?!!! What the heck?!!! That makes her sisters with the very three girls she set out to torment - and they have no idea that their tormentor is their half-sister. Yikes. And also the whole Courtney and Brittney thing -- what a sad and gruesome plot twist to throw in, but it still definitely shocked me and could be chalked up to being a super successful plot twist! I'm not particularly a person who likes to read about babies getting hurt, not at all, but the actual element of surprise itself stunned (and impressed) me greatly. I'm very intrigued with the life that these girls lead. They get brand new Range Rovers for each of them. They live in a penthouse suite in one of the most luxurious hotels on the Strip. They give away iPods at their Sweet Sixteens and buy bags that cost more than my upcoming college tuition. It's a strange and interesting life to read about, since I don't come from that walk of life -- and I don't know anybody else close to me that does. So I feel like I'm living vicariously through these characters with their glamorous dresses and weekends and partying and clubbing and going to all of these grand places. As someone who doesn't have hundreds of billions of dollars to give away on a whim, and as a definite non-owner of a Blamex, there's something satisfying about reading about their experiences. It's like reality TV, in a way. The only reason everyone envies the Kardashians is because of all of the money they have to spend. In reality, it isn't them we want to be. We want to be successful like them. So that's what this book feels like to me. It's definitely a good release when I've had a stressful day and I want to relax with a book that entertains me and that I can get lost in! All in all, Diamonds in the Rough was a great companion novel to The Secret Diamond Sisters. It's a book filled with romance, drama, and tons of awesome action, on top of the glitz and glam of the life of the One Percent. There's tons of stuff that relates to Gossip Girl without it being a rip-off, so if you're into those kinds of books, this one is definitely the one for you! 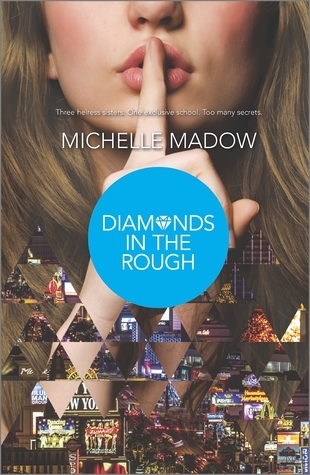 I'm also super excited because I just got approved for an ARC copy of Diamonds in the Rough - the third book in the series set to come out soon - so I am eagerly awaiting my copy and I can't wait to read and review it for you guys!